With today’s unstable economy, it’s not uncommon for one to find themselves in financial difficulties for a multitude of reasons. For some, those reasons may pertain to credit card debt, wage garnishment, tax liens, home foreclosure and automobile repossession. But for others, an unexpected injury at the workplace could be the hindrance of a steady income or the accumulation of medical bills, causing more issues than meets the eye. Fortunately James Monaghan, attorney and owner of the Law Offices of James V. Monaghan in Norristown can protect you in both cases. There are only 213 lawyers in the state of Pennsylvania who have met the necessary requirements to be certified by the Pennsylvania State Bar as an expert in workers’’ compensation according to Monaghan. He happens to be one of this select group of professionals. 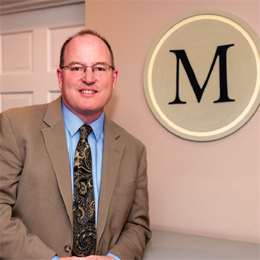 In addition to his workers’’ compensation work, Monaghan has been practicing bankruptcy law since 1991 and is a member of Bankruptcy Law section of the Montgomery Bar Association and the Pennsylvania Bar Association. He was awarded the Distinguished Service Award by the Montgomery County Bar association for his contribution to the public through the Legal Access Project, a program that allows legal representation for low income individuals at a reduced cost. While Monaghan says many lawyers gave up practicing bankruptcy law after significant changes to the law in 2006, he decided to seize that opportunity and specialize his practice. With hundreds of individuals and families represented by Monaghan, clients can be confident that they’re in the right hands. How did you decide on law as a career? As a high school student, I took a class on constitutional law which interested me. Honestly, I really didn’t have a full grasp at the time on what lawyers did. No one in my family at the time had a professional degree, nor did I know any lawyers through my parents. This one class, however, spurred my interest and I set off to get my law degree. Why did you decide on opening your own firm? I was with my prior firm for 19 years, 10 of those years as an associate and nine as a partner. I appreciate what the firm and my former partners did in serving as my mentors. They taught me a lot about running a law firm. I developed my practice and client base during those years at the firm—however, there came a time when I realized that if I wanted a true ownership in my practice, I needed to do it all alone. I left my former partners on good terms and I have never looked back. It’s certainly much easier for me to make decisions when I only have myself to agree with! I understand you’re a certified workers’’ compensation attorney. Why is this important for you and your practice? I’m not sure that becoming certified changed the way I practice law—I have always been dedicated to representing my clients’ interests to the best of my ability. However, the certification as an expert was a recognition by the Pennsylvania Bar demonstrating the unique skills that I have developed over my years of practice. It is truly something I feel sets me apart from many of my peers. To get this certification, you must successfully pass the test and meet certain qualifications to become certified. I think it’s important that when you hire an attorney, you get one recognized as an expert in the field. What are the necessary requirements and qualifications to become certified? First an application to be considered for worker’s compensation certification has to be completed. The application requires you to demonstrate the following: 1) that you have practiced at least 5 years; 2) that you devote at least 50% of your practice to workers’ compensation; 3) that you have handled a variety of matters in workers’ compensation, and; 4) that you have handled at least 25 expert witness depositions. It also requires a detailed description of 10 cases you have handled along with the names and contact information for the attorneys and judges involved in the case so they can be contacted regarding your performance. Lastly the application requires 3 writing samples. Once you have submitted the application and the Bar has determined that you meet the qualifications you are allowed to sit for a rigorous exam that consists of 100 multiple choice questions and two essays. You must achieve a score of 80 or better to pass. We are also required to submit a report of continuing legal education from the Supreme Court Continuing Legal Education Board, which shows we’ve completed at least nine hours of mandatory continuing legal education in workers’’ compensation each year. How long on average does a case dealing with bankruptcy and workers’ compensation take? A chapter 7 bankruptcy case typically lasts four to six months. A chapter 13 bankruptcy case generally lasts five years. Workers’ compensation cases vary wildly. I have cases that are over and done in six months, but I also have clients today whom I began representing in the mid 90’s. Workers’ compensation cases are organic in that many factors can change the course of the case. These factors include the type of injury, the age of the claimant, the type of work they do, the education of the claimant, the willingness of the claimant and/or insurance company and/or employer to compromise, the availability of restricted duty work, and the changing physical condition of the claimant over time. Why would it make sense for someone to need an attorney relating to bankruptcy or workers’ compensation? For both, the statutes, codes and regulations are complex. There are many things you can do or say that can adversely affect your ability to get relief in bankruptcy and the ability to maintain your benefits in workers’ compensation. As an example, in bankruptcy, there is a threshold test that determines your eligibility for a chapter 7. Certain things can be deducted from your wages that you would not know unless you were versed in the bankruptcy code. Furthermore, you must be very detailed with regard to your assets and liabilities. Many people simply say that they have no assets yet there are items such as 401ks, IRAs, timeshares and other assets that must be protected or they can be liquidated to pay your debts. In workers’ compensation, an injured worker may not be aware of how the average weekly wage is determined which is used to calculate your benefit rate. A small error by the insurance company can have drastic consequences. I counsel my clients regarding independent medical examinations, vocational interviews, return to work issues and a multitude of things that come up during the pendency of a claim. If handled incorrectly, you may jeopardize your right to continued wage loss benefits and medical coverage..